Robert James Gronkowski, professionally known as Rob Gronkowski is a former American football player who played in the tight end position. Drafted by the New England Patriots in the 2nd round with 42nd overall pick in the 2010 NFL draft, he has played his entire professional career for the Patriots. He is a three-time Super Bowl champion and a five-time Pro Bowl. He is considered the greatest tight end and the finest players of the all time. He has revolutionized the tight end position. He was ranked as No. 1 tight end for six consecutive years since 2013. He has achieved numerous accomplishments and accolades during his entire career. He recorded 521 receptions, 7,861 receiving yards, and 79 receiving touchdowns in his NFL career. He played college football at the University of Arizona. He has over 3.2 million followers on his Instagram. The New England Patriots tight end Rob Gronkowski has retired from NFL. He announced his retirement via Instagram on 24 March 2019. He wrote on his Instagram, "It all started at 20 years old on stage at the NFL draft when my dream came true, and now here I am about to turn 30 in a few months with a decision I feel is the biggest of my life so far. I will be retiring from the game of football today. I am so grateful for the opportunity that Mr. Kraft and Coach Belichick gave to me when drafting my silliness in 2010. My life experiences over the last 9 years have been amazing both on and off the field. The people I have meet, the relationships I have built, the championships I have been apart of, I just want to thank the whole New England Patriots organization for every opportunity I have been giving and learning the great values of life that I can apply to mine. Thank you to all of Pats Nation around the world for the incredible support since I have been apart of this 1st class organization. Thank you for everyone accepting who I am and the dedication I have put into my work to be the best player I could be. But now its time to move forward and move forward with a big smile knowing that the New England Patriots Organization, Pats Nation, and all my fans will be truly a big part of my heart for rest of my life. It was truly an incredible honor to play for such a great established organization and able to come in to continue and contribute to keep building success. To all my current and past teammates, thank you for making each team every year special to be apart of. I will truly miss you guys. Cheers to all who have been part of this journey, cheers to the past for the incredible memories, and a HUGE cheers to the uncertain of whats next". The 29-years old is considered one of the finest football players and the greatest tight end of all time in NFL history. He spent entire of his NFL career playing for the Patriots and has achieved numerous accomplishments and won numerous accolades in his career. He is the 3 times Super Bowl champion and 5 times Pro Bowl champion. - Considered one of the finest footballers in NFL History. - Considered the greatest tight end ever in NFL History. - 3 times Super Bowl Champion. - 5 times Pro Bowl Champion. Where was Rob Gronkowski Born? Rob Gronkowski was born on 14 May 1989. His birth name is Robert James Gronkowski. He was born to a father, Gordon Gronkowski, and a mother, Diane Walters. He is of Polish descent. His birth place is in Amherst, New York in the United States. He holds American nationality. His zodiac sign is Taurus. He has four siblings, Glenn, Chris, Gordie, and Dan. All four of his brothers played professional sports such as football and basketball. He was raised in Williamsville. His parents got divorced in 2006. He was a senior in high school at the time. He attended Williamsville North High School where he played basketball, baseball and football. He recorded 36 receptions for 648 yards and 7 touchdowns on offense, and 73 tackles and 6 sacks on defense as a junior at Williamsville North High School. He was named an All-Western New York first-team and All-State second-team player. He was academically in the National Honor Society. He then moved to Suburban Pittsburgh where he attended Woodland Hills High School in Churchill as the senior. He was initially ruled ineligible by the Western Pennsylvania Interscholastic Athletic Leauge because of his transfer. Later, his ineligibility was overturned, he recorded 8 receptions for 152 yards and 4 touchdowns. He was named a SuperPrep All-American, PrepStar All-American, Associated Press Class 4-A all-state, Pittsburgh Post-Gazette "Fabulous 22", Pittsburgh Post-Gazette first-team all-conference, The Patriot-News (Harrisburg, Pennsylvania) "Platinum 33", and a Pittsburgh Tribune-Review "Terrific 25" player. He received offers from various colleges including Kentucky, Arizona, Clemson, Louisville, Maryland, Ohio State, and Syracuse. After graduating from high school, Rob enrolled at the University of Arizona and committed to play for the Arizona Wildcats football team. He played under the head coach Mike Stoops. He recorded 28 receptions for 525 yards and 6 touchdowns in his freshman year. His 18.8 yards per reception average was the best on the team and his receiving yards were a school record for a tight end. He was named The Sporting News freshman All-American, Rivals.com freshman All-American, The Sporting News freshman Pac - 10, and All-Pac-10 honorable mention player. He missed the first three games in his sophomore season. In the end, he recorded 47 receptions for 672 yards and a team-best 10 touchdowns. He set the school records for a tight end for single-game, single-season, and career receptions, yards, and touchdowns. He was named an Associated Press third-team All-American and All-Pack-10 first-team tight end. He was placed on the watchlist for the Lombardi Award prior to the 2009 season. He missed his junior season in 2009 due to back surgery. The New England Patriots selected him in the 2nd round with 42nd overall pick in the 2010 NFL draft. On 25 July 2010, he signed a four-year contract worth $4.4 million with a $1.76 million signing bonus. He was one of the three NFL players to score 4 touchdowns during the 2010 preseason. He made his NFL debut against the Cincinnati Bengals. He became the first rookie in Patriots history, and the youngest rookie in NFL history to post three touchdown passes. He caught three touchdown passes from Tom Brady in a Week 10 victory over the Pittsburgh Steelers. He started 11 out of 16 games he played and recorded 10 touchdowns and 546 yards. He was the first rookie tight end since the NFL-AFL merger to score 10 touchdowns. The Patriots won the AFC East. He was nominated three times for Pepsi NFL Rookie of the Week and won it twice. He ended the 2011 season with 1,327 receiving yards, 18 touchdowns, 17 receiving touchdowns. He broke the previous NFL record for a tight end of 1,310 receiving yards set by Jimmy Graham. He became the first tight end in NFL history to post 17 receiving touchdowns in a single season. He was voted the starting tight end for the AFC at the 2012 Pro Bowl. He was voted the tight end for the AP All-Pro first team. He suffered a high ankle sprain in a 23-20 win over Baltimore Ravens in AFC Championship in the Patriots' playoff game. He underwent surgery. He signed a 6-year contract extension with the Patriots worth $54 million with $8 million signing bonus in June 2012. It was the largest ever deal as a tight end. He became the third tight end in NFL history to achieve three seasons with at least 10 touchdown receptions and the first ever to do it in consecutive seasons. He broke his left forearm in the Patriots' Week 11 59-24 win over the Indianapolis Colts. He re-injured his left arm in the Patriots' first playoff game against Houston Texans. He underwent another surgery and missed the remainder of the playoffs. He posted 790 receiving yards and 11 touchdowns in 11 games in the 2012 season. He underwent a third surgery on his forearm in February 2013 after he was diagnosed with an infection. He underwent fourth surgery to his forearm to replace the hardware implanted in the second procedure and perform tissue biopsies. He underwent back surgery in June 2013. He was cleared to play in October 2013 but suffered a right knee injury in a game against the Cleveland Browns in December 2013. He tore his ACL and MCL ending his 2013 season. He posted 592 receiving yards and 4 receiving touchdowns in 6 starts in the 2013 season. He became the first tight end in NFL history to catch at least 10 touchdowns in four separate seasons when he posted over 10 touchdowns in the 2014 season. The Patriots won the AFC East and Super Bowl XLIX. He was fined twice in the 2014 season. He was fined once for "unnecessary roughness" against the Indianapolis Colts safety Sergio Brown. He was later fined for "striking an opponent" at the Super Bowl XLIX against the Seattle Seahawks. He won the Comeback Player of the Year award at the 2015 ESPY Awards for his 2014 season. He became the first player in NFL history with multiple three-touchdown-reception games against the Pittsburgh Steelers when he posted the three-touchdowns against the Steelers. He suffered a right knee injury in the Patriots' first loss of the season against the Denver Broncos in November 2015. He posted 1,018 yards and 10 touchdowns in the 2015 season. He missed the first two games of the 2016 season due to the hamstring injury. He broke both the Patriots franchise records set by Stanley Morgan when he scored the 69th regular-season touchdown, also hist 68th receiving touchdown of his career. He was ruled out of the 2016 season after he suffered a back injury against the New York Jets in Week 12 of the 2016 season. He underwent surgery to repair a herniated disk. He posted 25 receptions on 38 targets for 540 yards and 3 touchdowns in the 2016 season. He was on injured reserve when the Patriots won Super Bown LI in February 2017. He broke the franchise record held by Randy Moss with 16th multiple touchdown games after he posted 2 receiving touchdowns against the Miami Dolphins in the 2017 season. He was suspended for one game when he drew a personal foul penalty while jumping elbow-first onto Tre'Davious White of the Buffalo Bills during Week 13 game. He became the 3rd NFL tight end with four 1,000-yard seasons. He finished the 2017 season with 69 receptions for 1,084 yards and 8 touchdowns. He was named to the Associated Press' All-Pro First Team earning him a $2.5 million incentive. He was rumored to retiring ahead of the 2018 season. However, he announced that he would return for the 2018 season. He finished his 2018 season with 47 receptions for 682 receiving yards and 3 receiving touchdowns. He posted 87 receiving yards for the Patriots when they won Super Bowl LIII against the Los Angeles Rams. When Did Rob Gronkowski Retire? Rob Gronkowski announced his retirement via Instagram on 24 March 2019. 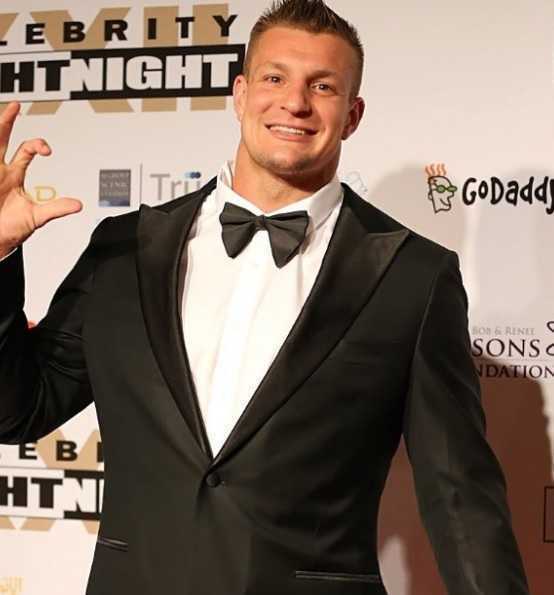 He has co-written a memoir, It's Good to be Gronk in July 2015. He co-wrote the memoir with Jason Rosenhaus. It became a New York Times Bestseller. ESPN listed him in "World Fame 100" list of most famous athletes in the world in 2019. He was featured on the covers of GQ, ESPN The Magazine, ESPN The Body Issue, Sports Illustrated, and Muscle & Fitness, among others. He was the cover of video sports game Madden NFL 17 in 2016. He has appeared as fictionalized versions of himself in the 2015 film, Entourage and in an episode of Family Guy in 2017. He appeared in the American crime-drama thriller film, American Violence and You Can't Have It, both in 2017. He is a wrestling fan. He appeared at WWE's WrestleMania 33 where he helped his real-life friend Mojo Rawley win the Andre The Giant Memorial Battle Royal. He was the co-host of Crashletes from 2016 to 2017 on Nickelodeon. He has competed against the actress Gina Rodriguez in the second episode of TBS's Drop the Mic in 2017. He appeared on ABC's Shark Tank in 2017. He joined Discovery Channel's Shark Week in July 2018. He helped tagged endangered tiger sharks in the Bahamas. He hosted the Verizon's Go90 original show, MVP in 2017. He also produced the show. Who is Rob Gronkowski Dating? Rob Gronkowski is unmarried. His sexual orientation is straight. He is not single. He is in the relationship with the host and model Camille Kostek. The couple started dating in 2015. Rob occasionally shares her pictures on his Instagram. No other information about his personal life is available at present. Rob Gronkowski stands at a height of 1.98 m i.e. 6 feet and 6 inches tall. He has a body weight of 268 lbs i.e. 122 kg. He has an athletic body build. He has a chest size of 49 inches, biceps size of 17 inches, and a waist size of 36 inches. He has dark brown eyes and his hair color is light brown. What is Rob Gronkowski's Net Worth? When he was drafted by the New England Patriots, he signed a four-year deal worth $4.4 million with a $1.76 million signing bonus in July 2010. He extended his contract with the Patriots in June 2012, signing a 6-year deal worth $54 million with $8 million signing bonus. He earned $8 million via several endorsements in 2018. He has appeared in numerous print, television, and online advertisements. He has appeared for the popular brands such as Nike, Dunkin' Donuts, Visa, T-Mobile, Tide, Lyft, Zynga, Cheerios, Oberto, SixStar Pro, Bodyarmor SuperDrink, DraftKings, Kids Footlocker, and video games Mobile Strike and Halo. PLB Sports started manufacturing a frosted cornflakes breakfast cereal named "Gronk Flakes" in 2012. PLB Sports released "Gronk's Hot Sauce" in 2015. In 2016, Gronkowski and Monster Energy released a signature "Gronk" beverage. As of 2019, his net worth is estimated at $40 million. His father played college football as a guard for Syracuse University. His great-grandfather, Ignatius Gronkowski was a cyclist with five world records. He played hockey until he was 14-years old. In his honor for posting three touchdowns in a rookie season, Madden NFL 12 has a "Rob Gronkowski Award" for players who have a tight end catch three or more touchdowns in a single game. He is considered the "most complete" player as he has both the catching dexterity of a wide receiver and the skills of an offensive lineman. He has been compared to NBA's LeBron James and Shaquille O'Neal for his hands measuring 10 and 3/4 inches from thumb to pinkie. He is known for his Gronk Spike scoring celebration and dance before spiking. He wore shirt number 87 for the Patriots. Rob partnered with Tide for a public service announcement discouraging children and teens from eating the laundry detergent pods after a viral internet challenge in 2017-18. He has founded the Gronk Nation Youth Foundation together with his family. It provides grants to sports programs with an emphasis on health, community, and fitness. His phrase during an on-air interview after an AFC Championship win in 2012, "Yo Soy Fiesta!" went viral and was granted a trademark for the phrase the same year. The phrase translates to "I am Party! ".